Consider the following statistics: on any given day, more than 87,000 flights travel across U.S. airspace and in one year, U.S. air traffic controllers handle an average of 64 million takeoffs and landings. With such an overwhelming number of planes, assets, and human lives at stake, you would expect the U.S. air-traffic control system to be the most modern in the world. However, that title goes to the Canadian counterpart of the U.S. Federal Aviation Administration (FAA). NAV CANADA is the world’s second largest air-traffic control agency and has been praised around the world for its paper-less technology that results in shorter flights and smaller fuel uses. Let’s review some of the key lessons that contract management professionals can learn from the implementation of a digital air-traffic control system north of the border. A major obstacle to implementing a digital air-traffic control system like the one in Canada in the U.S. is the initial investment. For example, the FAA is still haunted by its failed development of an automated system back in the late 1990s that lead to a loss of more than $1 billion. Still, the investment has paid off for NAV CANADA. Not only has the agency earned an estimated $105 million over the past five years from exporting its technology, but also NAV CANADA has reduced the fees it charges to passengers for the third time. Another example of cost savings from the digital air-traffic control system is that the full-time job of printing out and distributing paper strips is completely eliminated. In contract management, companies transitioning from a paper-based CLM system to a digital one will also have to make an initial investment. However, the investment enables the companies to achieve operational efficiencies and transfer cost savings to their clients. This makes a company more competitive. In the U.S., frontline controllers rely on paper strips that are printed on the other side of the room. They have to make decisions without the latest information. On the other hand, Canadian frontline controllers have access to computerized systems that look 20 minutes ahead for potential collision paths. A similar situation takes place when a contract manager relies on a paper-based CLM system or an Excel spreadsheet sent via email from home office. He may not be aware of the latest legal review of one or many clauses and enter into a contractual relationship using potentially outdated clauses. On the other hand, a centralized CLM system provides access to the latest contract templates and clauses at all times, enabling staff to securely draft and negotiate contracts. 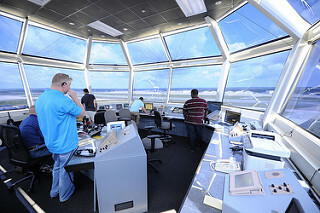 Unlike radio communications between pilots and controllers in the U.S., text message exchanges are exchanged between Canadian pilots and controllers. By using text-based communications, the digital air-traffic system does away with the potential of mishearing instructions due to radio static, feedback during transmission, or accent from an individual. Also, automated text messages can update incoming pilots on airport issues, such as construction on runways or changes in gates. With a paperless CLM system, you can setup automated email alerts that let team members know that a milestone has been completed or that an assignment is now ready. This eliminates the need for redundant phone calls to notify about next action steps and provides immediate updates. In the U.S., most air controllers rely on paper printouts in plastic carriers about the size of a six-inch ruler to take notes about a route. For more than13 years, NAV CANADA air controllers have exchanged notes digitally, allowing for immediate communication and documentation of all data related to flights. One of the latest developments of NAV CANADA is the use of tablets to receive pre-shift briefings and log into sessions. This replaces the use of sign-in sheets and binder books. Similarly, a CLM system can house all data related to your contracts. Not only can a CLM system centrally store all documents related to a specific client or contract but also use optical character recognition (OCR) software to turn scanned documents into searchable text files. Just like the use of tablets by NAV CANADA, the use of log-in accounts by CLM systems provides accountability through the record-keeping of by who and when tasks are completed. Just like in the air-traffic control industry, in the contract management industry the transition from a paper-based system to a digital one can provide several benefits, including reduction of operational costs, increased visibility of processes, automation of alerts, and improvement in documentation processes.